A native of Los Angeles, Firefighter/Lead Paramedic Michelle Banks is a founding Board Member and the first President of the African American Firefighter Museum (Museum). Embodying the pioneering spirit of the African American firefighter, Michelle joined the Los Angeles Fire Department (LAFD) in 1984. 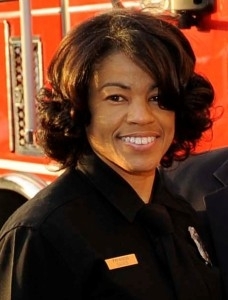 She is the LAFD’s third uniformed African-American woman, second African-American female Paramedic, and the first Special Assistant to the Fire Chief. Ms. Banks creatively applies her community volunteer and professional experience in emergency management, strategic planning, communications, leadership development and community risk reduction to support the Museum’s mission and facilitate programming. Whether it is collaborating with Los Angeles artists to create educational art workshops and storytelling programming for children or recruiting future firefighters, Michelle is an advocate for the preservation and sharing of the African American Firefighter legacy of excellence despite adversity. Ms. Banks’ commitment to the fire service and dedication to enhancing the community’s well-being has been acknowledged by a variety of sources, including California Senator Curren D. Prices Jr.s’ 2013 SHero Award and the Los Angeles City Women of Courage Award in 2000. Ms. Michelle Banks has a B.S. in Health Administration from the University of California, Davis; and a M.A. in Organizational Leadership from Woodbury University.